I know, I know… I promised that I wouldn’t become a dreaded mommy blogger now that I have a baby. 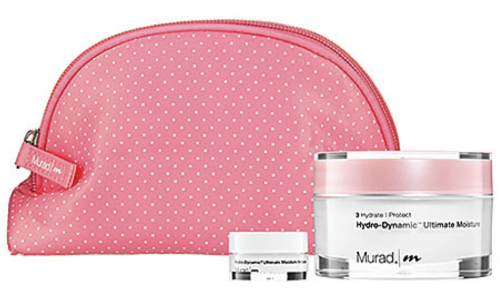 BUT… It’s my duty to share with you my latest skincare love affairs. And, if said beauty product of my affection just so happens to be effective on both my bitchy sensitive skin and my 7-week-old baby, you should probably take note. I’m not sure why it took me so long to try Egyptian Magic. I know I’ve read over the years that celebrities like Kate Hudson, Brooke Shields, Rachel Zoe, and Nicole Richie swear by the stuff for its “healing powers” for dry skin. I’m pretty sure Sephora used to carry it as well. What got me to finally take the leap was a trip to Costco. Yeah, that’s right Costco. 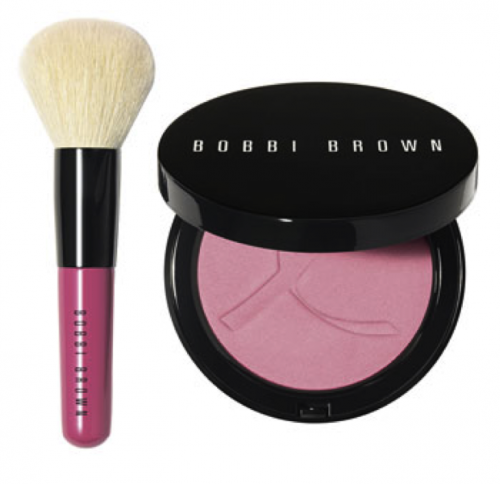 You would be shocked at the treasures you would find in their beauty aisles. So I went ahead and bought the set, which includes the 4 oz. and 2 oz. jars. 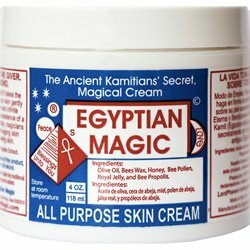 I went home and did a little research and found that not only is Egyptian Magic touted as a “miracle balm” for dry, sensitive skin, but it can also be used as a baby cream and diaper cream. The all-natural balm is made with only six ingredients — Honey, Beeswax, Olive Oil, Royal Jelly, Bee Pollen and Bee Propolis. No additives, preservatives, fragrances, chemicals or parabens. I use it every night as a sleeping moisture mask and I slather it on Baby Stella’s little body and her face after baths. (She loves a good massage just like her mommy) Not only has her dry skin gone away but her (gasp!) hormonal breakouts disappeared after a couple uses of the Egyptian Magic. 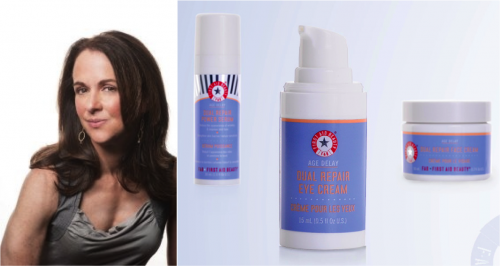 According to their website, the balm can also be used as an eye gel, a hair masque, burn and wound relief, and a shaving balm. I personally think it’s a bit pricey to use as a hair masque, but I can get why it would be good for the tresses. Unfortunately it does have one of those thick creamy consistencies that can be really addictive. It takes every bit of restraint for me to not stick my whole hand in the jar and scoop out enough to hydrate the neighborhood. Of course if I have a moment of weakness I can always steal Baby Stella’s jar… JOKES! P.S. Do not buy Egyptian Magic on Amazon, Ebay or in China Town! There are tons of counterfeits out there. You can buy it direct from them here. Come on, how great does Baby Stella’s skin look??? Happy Thanksgiving, lovelies! Listen, we all know Thanksgiving is a time for thanks and family, but let’s be honest — it’s also about the feast! If you’re anything like me, you’re a whore for desserts so you carefully ration your turkey and stuffing intake to ensure you save room for pumpkin pie. My problem — I end up eating more than the standard portion. There, I said it. I have a pie problem, especially where pumpkin is concerned. 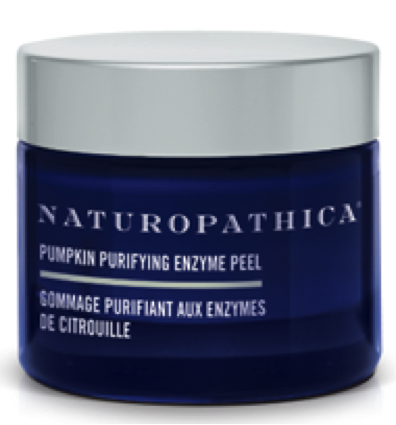 So in order to minimize my caloric intake, I try and satiate my pumpkin pie craving while gently exfoliating and decongesting my skin with Naturopathica Pumpkin Purifying Enzyme Peel. I cleanse my skin before I shower and then apply the enzyme peel mask and leave it on in the shower. The steam from the shower helps activate the enzymes. This exfoliating mask is gentle yet effective — I was even able to use it during my pregnancy. CINNAMON BARK, OREGANO & ROSEMARY EXTRACT:A potent trio of antiseptic herbs. 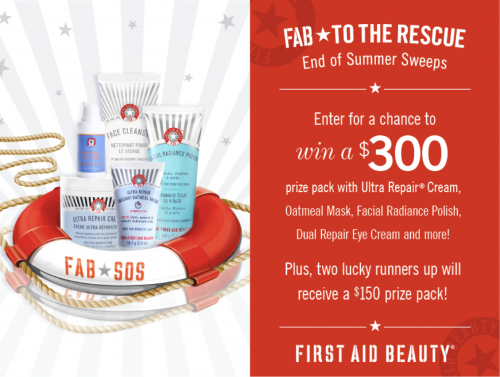 Best Way to Get Skin Ready for Fall: Win Free Products from First Aid Beauty! For those of you who’ve read Beauty Binge from the beginning you know I worship at the house of First Aid Beauty. I find that it’s one of the only skincare brands that acts as a Valium to my overly sensitive drama queen skin. Um, thank GOD for their Ultra Repair Cream during my pregnancy. At first I was hesitant to waste that fluffy hydrating goodness on my body… But, when my belly and legs got attacked by a bad case of the pregnancy itchies, I found the Ultra Repair was the only cream that managed to calm my skin and prevent me from lighting it on fire. I was also worried I wouldn’t be able to keep up any kind of anti-aging regimen while I was pregnant but after doing some research I found the Dual Repair line was safe for mommys-to-be. 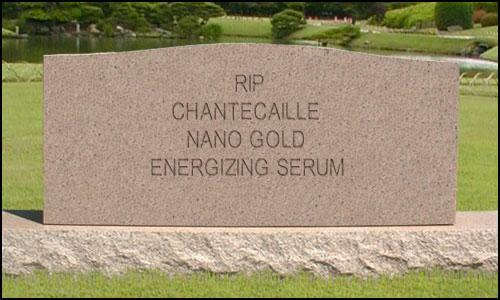 So I use the Dual Repair Power Serum every day before my moisturizer. Everyone wins. 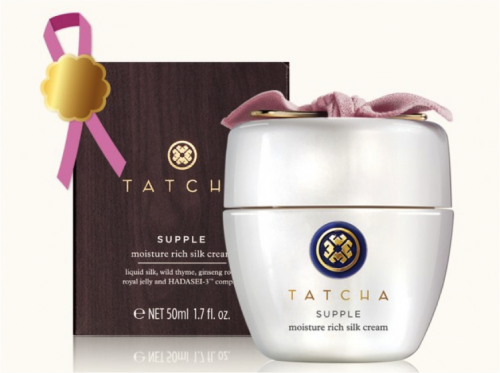 – 1 Grand Prize: $300 prize pack including Ultra Repair Cream, Oatmeal Mask, Facial Radiance Polish, Dual Repair Eye Cream, and more! Hello, my lovelies! I couldn’t be more excited to share with you my first article in the Huffington Post Style Section! It’s called “3 Skincare Crimes I Know You’re Guilty of Committing“ and I hope you like it! If you do make sure you share on Facebook, Twitter and most importantly leave a comment on Huffington Post (right below my article). Screw the DJ… Last Night a Decleor Balm Saved My Life! If you’re living anywhere that is experiencing harsh winter-like conditions (and by harsh I mean the barometer dips below 50 degrees) then chances are you’re getting blasted by dry heat in your house or apartment. There’s a reason why all the skincare experts tell you to up the moisturizer ante during the winter — it isn’t just the cold dry air outside, it’s the scorching desert inside which makes you wake up to crispy uncomfortable skin. Good Morning. Not really. The worst is when I wake up to crispy skin that at closer inspection are hiding blackheads! The crispy dry skin traps in the oil making it a safe haven for blackheads and other interlopers to form, making my skin ever more of a moody drama queen. So how do I cure my case of the crispy oily uglies? Decleor ‘Aroma Night’ Neroli Essential Night Balm ($73) is seriously this miracle balm that before bed whether my skin is feeling dehydrated, oily, on the verge of a breakout, or all the above — I wake up to softened, balanced skin. I’m sorry, but that’s a miracle if I’ve ever heard one. The balm is literally the consistency of a lip balm so be prepared you’ll need to scoop out a little chunk and then emulsify it by rubbing it and melting it your hands before slathering on the goodness. Even though Neroli is in the title don’t be fooled — it definitely doesn’t smell of citrus, rather a warm, delicious herbal scent. I like to take the time to really massage it into my skin and inhale the bouquet of notes and, “ahhhhh” I am ready for slumber. And then I wake up like Christmas morning to softened, balanced skin! Voila!